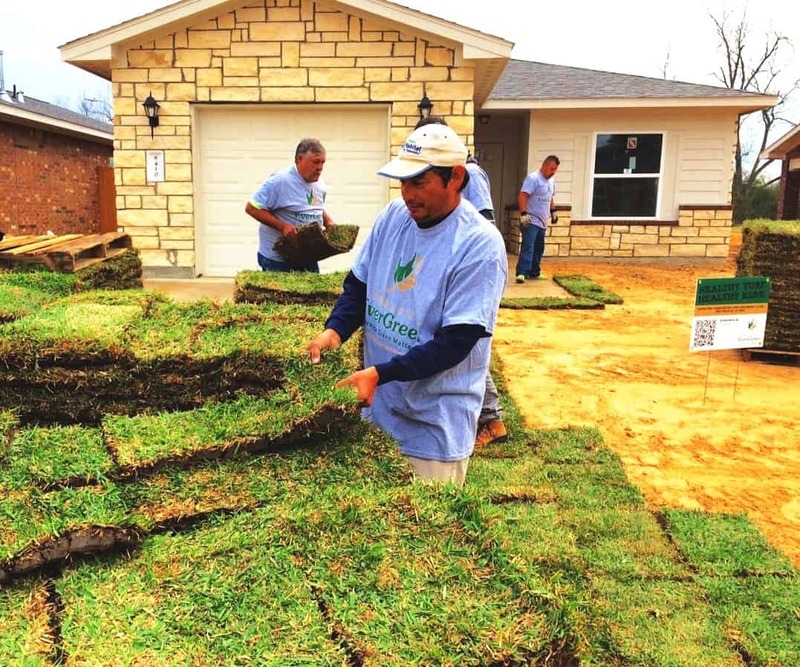 Project EverGreen and Houston Habitat for Humanity teamed up for the second consecutive year to give the gift of healthy green spaces when they installed lawns and landscapes for five new homes in Houston’s Harrell Park subdivision. Project EverGreen and landscape volunteers BrightView, Triangle Turf, Champion Turf and Lucky Landscape Supply provided the landscape materials and labor to install Oak trees, ornamental shrubs, mulch and more than 22,000 sq. ft. of harvested sod to the five houses. The Texas Nursery and Landscape Association and the Turfgrass Producers of Texas Association also participated in the effort. The project included installation of Oak trees and an assortment of azaleas, boxwoods, gardenias and ferns, and mulch beds around the five houses to create a landscape that complements the new turf and creates a greener, cooler landscape for the new homeowners to enjoy. The work was done as part of Houston Habitat for Humanity’s “SuperBuild” initiative that was sanctioned by the National Football League and Houston Super Bowl LI Host Committee. The Harrell Park Subdivision that was established by Habitat in 2013 and is home to more than 110 families. •	Trees, shrubs and turf remove smoke, dust and other pollutants from the air. One tree can remove 26 pounds of carbon dioxide annually. •	Not only does your lawn release oxygen and absorb carbon dioxide, it lowers temperatures caused by soil and hard surfaces. Lawns can be 31 degrees cooler than asphalt and 20 degrees cooler than bare soil. •	Green spaces improve mental functioning and physical well-being. In fact, residents of areas with the highest levels of greenery were 40 percent less likely to be overweight or obese compared to those living in less green space. •	The proper placement of just three trees around a home reduces interior house temperatures, allow air conditioning units to run more efficiently and offer homeowners $100 to $250 in savings annually.